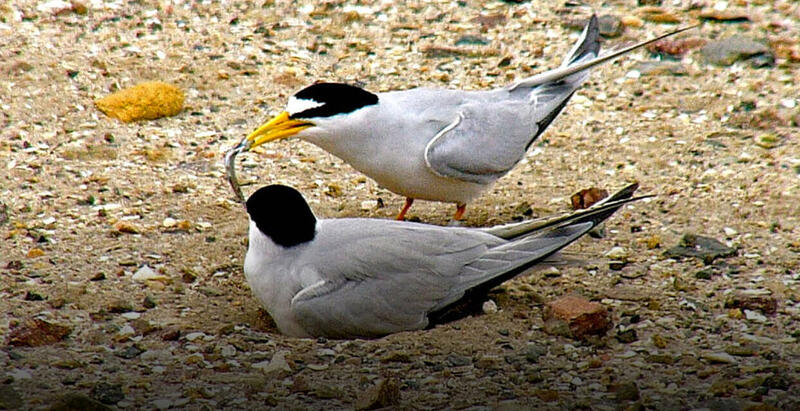 Our conservation research program for the California least tern is focused on adaptive management strategies to encourage successful nesting at Naval Base Coronado and Marine Corps Base Camp Pendleton. Approximately 35-percent of the population breeds at these two sites, making continued protection and monitoring of these sites critical for least tern survival. Every year, our Recovery Ecology field crews conduct systematic searches to locate and mark nests and alert the military of their presence. We record nest success and chick survival, estimate the number of pairs and offspring, and identify predation threats and human disturbances. At Camp Pendleton, we conducted a three-year study to understand the habitat features that are important for nest placement. To determine chick survival, we banded chicks and began a recapture study at both sites. This allowed us to investigate chick growth, as well as survival and movement patterns. At Naval Base Coronado, we conducted a social attraction study using playbacks of tern calls in hopes of attracting terns to newly created habitat. In addition, we collaborated on a study by local wildlife biologists to attach small data loggers on several terns. Data loggers will later be retrieved and the information collected will help to identify the birds’ migration and overwintering locations. While we continue our monitoring efforts to determine nesting success, we plan to work with our partners to capture previously banded terns in an effort to fill gaps in our understanding of key traits such as adult survival and site fidelity. We also hope to begin studying how food resources influence chick survival. Our ultimate goal is to incorporate information from both of these two critical sites into a meta-population model that will help conserve this species along its entire coastal range.